Help ban bullfighting in the Balearics! Thousands of bulls are tormented and killed during bullfights in Spain. This bloodsport is gaining a strong and growing opposition from Spanish citizens, who think that public entertainment can never excuse cruelty to animals. Recently, more than 140,000 citizens added their voice to the Mallorca Without Blood campaign, led by AnimaNaturalis and CAS International, which aims to end bullfighting in the Spanish Balearic Islands. Members of the Balearic Islands will soon vote on the future of bullfighting in their region, where 31 towns have already expressed their opposition to this barbaric practice. Join us in ensuring that the Balearic Islands becomes the third Spanish Autonomous Community to ban cruelty to bulls by sending a letter to Spanish politicians! Sign this petition to speak out against the horrific torture and slaughter of bulls planned for early February in Tlacotalpan, Mexico. The San Fermin bull running festival in Pamplona, Spain commences on Monday 6th July. 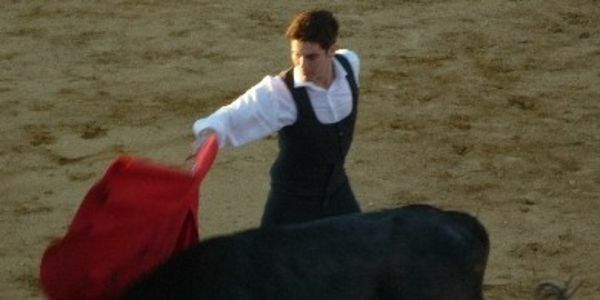 The main component of the festival, the bull running, commences on the second day and will see many bulls, up until the 14th July, subjected to the arduous mental and physical torture of being forced to participate in the bull runs before their public executions in front of thousands of jeering tourists in the bullfights that follow. via League Against Cruel Sports. 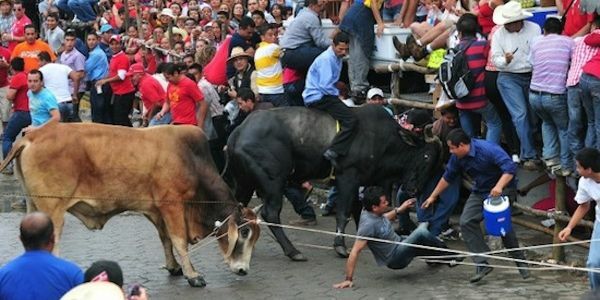 I can’t imagine the terror a bull must feel as it is chased, slapped, punched and yelled at as it runs through crowds. I can’t image the fear it must feel when a group of people surround it and kill it with knives, fists and whatever else they have handy. I can’t imagine how it must feel when, in its dying moments, it sees two men fighting over who claims the ‘honour’ of dealing the killing blow. And I can’t even begin to imagine what is wrong with these people, that they see it as ok to frighten, abuse and torture a living creature. Please read this article and sign the petition, calling on the EU to stop using public funding for these cruel, barbaric events. Public funding of over £110 MILLION, which could be used for healthcare or education. Let’s make change happen, sign the petition and together we can help make this world a better and safer place for animals. Urge India to Stand by Ban on Cruel Jallikattu | Take Action | PETA.org.uk – 1. In 2014, compassionate people all around the world celebrated when India’s Supreme Court confirmed the ban on the cruel “sports” of jallikattu (or bull taming), bull racing and bullfighting. But now, according to news reports, it looks like that progress could be undone. India’s central government plans to amend The Prevention of Cruelty to Animals Act, 1960, to once again legalise these events in which animals are barbarically abused for entertainment. Did you know that your taxes help fund the bullfighting industry? Next week, on Wednesday the 22nd October the European Union will vote on budgets for 2015. Each year the European Union provides an estimated £110 million through Common Agriculture Policy payments to farmers who breed bulls for bullfights. £13.5 million comes from the UK alone. Yes, this means that some of your hard earned tax is helping to support this barbaric industry. Next Wednesday your MEP will have an opportunity to support and vote for an amendment to prohibit the use of European funds to support farmers who breed bulls for bullfights. Green MEP Indrek Tarand has tabled a proposal to prohibit European subsidies being used to support these farmers. This amendment will be voted on in the European Parliament next Wednesday, with a roll call vote. That means that we will know exactly who supports these subsidies and who does not. The European Convention for the Protection of Animals kept for Farming Purposes is clear: Animals should not suffer pain, injury, fear or distress.